"It's so exciting to see planners working with technology and GIS," said Colby Brown from Citilabs, a company that provides data, services, and software that includes GIS tools for transportation analytics. "It's been a real revolution, hasn't it?" 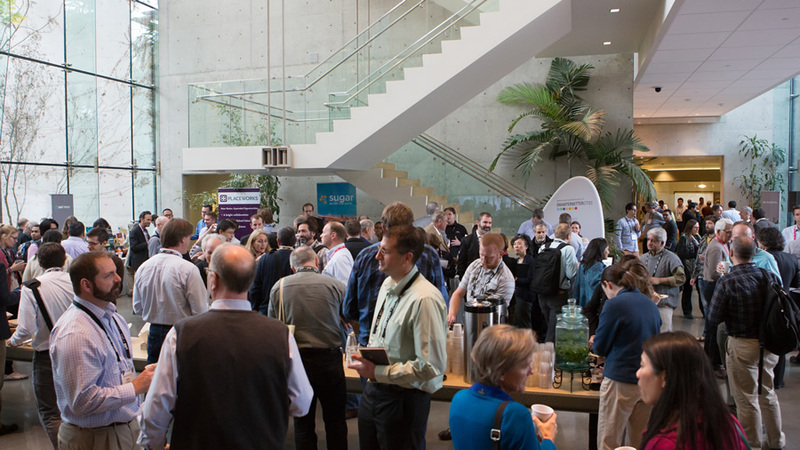 This year's summit at Esri headquarters in January drew a diverse group of more than 300 professionals who work in planning, landscape architecture, engineering, real estate, development banking, government, academia, geography and GIS, and conservation organizations. "They are drawn to this unique event because they realize that planning for the future requires a system or multidisciplinary approach to planning based on both values and science," said Shannon McElvaney, global industry manager for community development at Esri and the summit's organizer. "This type of integrative thinking and awareness of the effects of our collective actions is the future of planning and design." 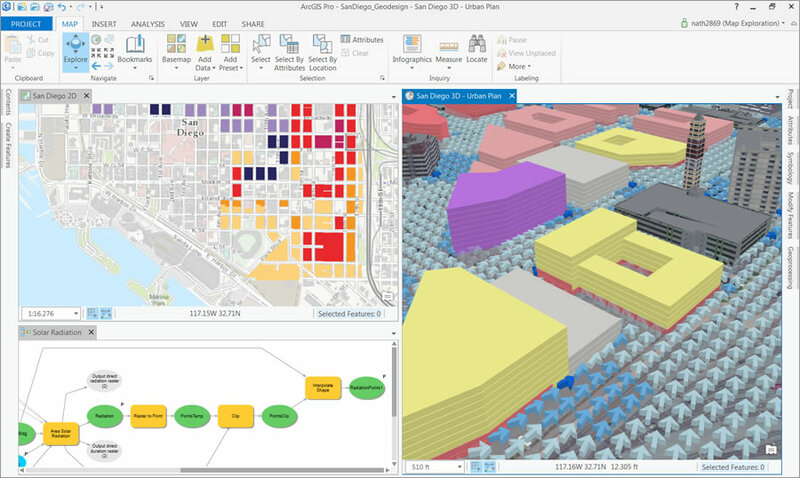 Web GIS and 3D, including tools for analytics, are nudging geodesign in new directions, helping in the creation of smarter, more efficient cities. This work advances what Esri president Jack Dangermond called the goal of "creating a better future." During a talk Dangermond gave at the summit, he underscored the importance of getting things right in the face of serious challenges to humanity. 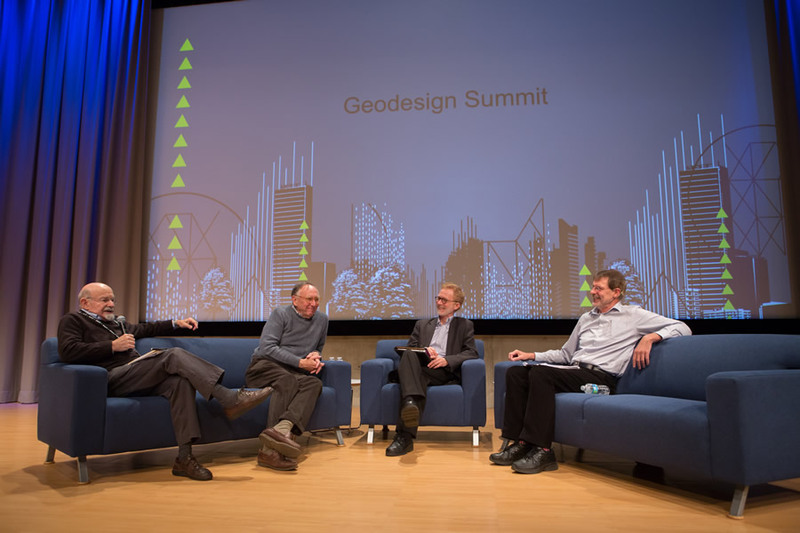 "Geography as the science of our world and geodesign as a methodology that employs it are more important than ever," Dangermond said. "They provide the context and content for making spatial decisions. They provide the practical means for implementing change." "Geodesign," he said, "is both an ancient idea and a new idea supported by new and advancing technology. 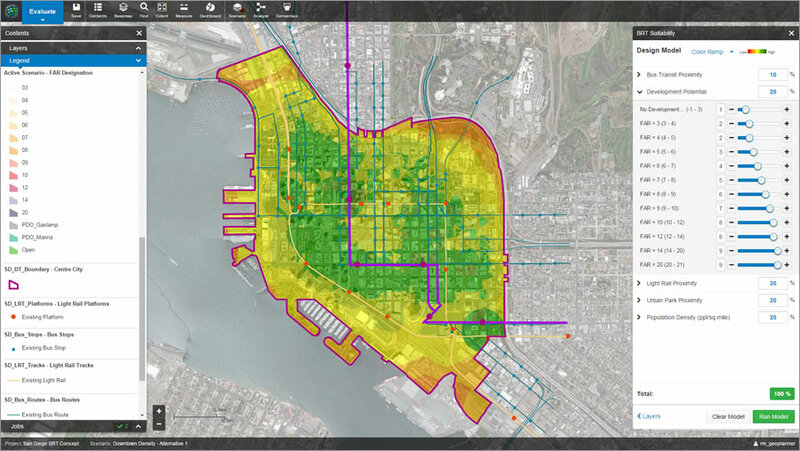 I see GIS integrating into almost anything we do." Watch the video of Dangermond’s presentation. Assisted by his Sweco colleagues, Månsson used GIS tools to help build the foundational land data for Blockholm, a replica of Stockholm, Sweden, that would go into Minecraft. They used, for example, Esri's ArcGIS Data Interoperability, an ArcGIS for Desktop extension, to process real spatial data such as topography, waterways, roads, and property information and generate it in 3D. 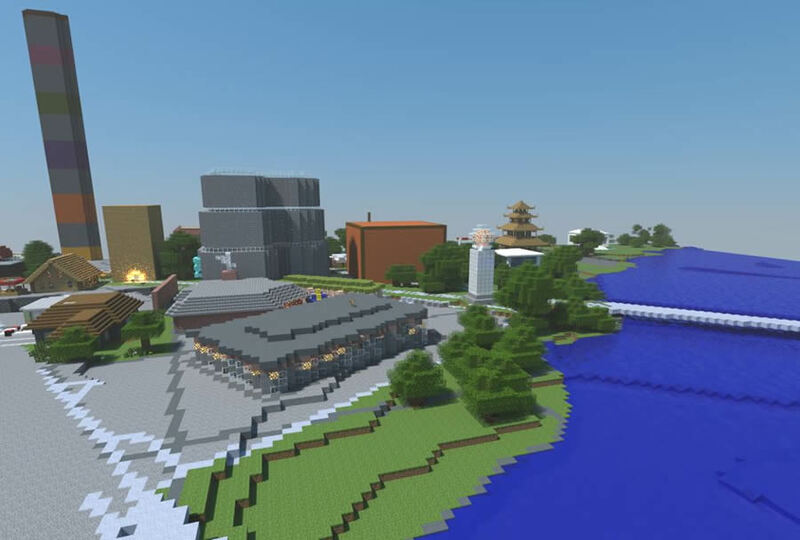 The ArcGIS Data Interoperability extension now natively supports Minecraft formats so you can even read the data back, Månsson said. "So if you set up a project like this where you invite players to rebuild a world, you can compare [worlds] before and after and just take out the pieces that have changed and bring them back to a GIS system such as [Esri] CityEngine," he said. "You could go from a CityEngine model to Minecraft, have it edited there, and then bring those edits back to CityEngine." Blockholm essentially married "geo" and design in a virtual world. "What is a city? 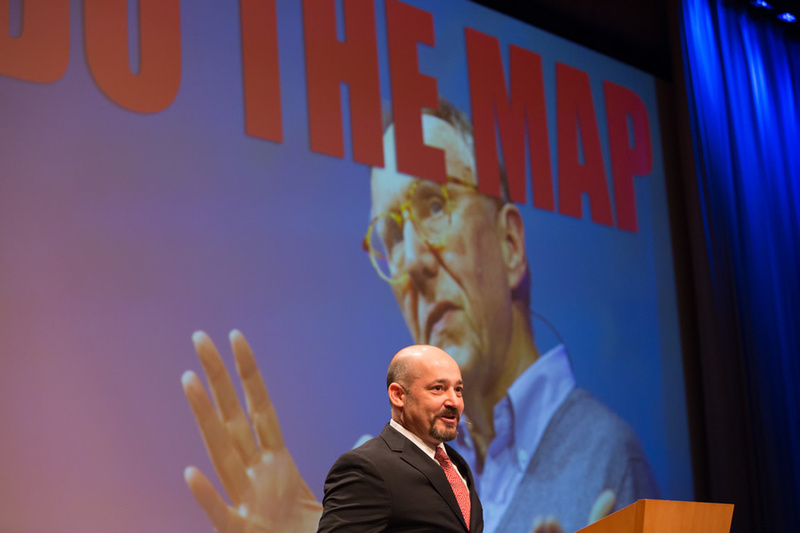 For me, a city is a finite boundary of land that has to be managed," said Minicozzi, an architect and urban designer who gave a featured presentation at the summit. "It is essentially a farm that grows a crop of buildings. There is a cash flow behind all of that. My task here is to explain that cash flow." Minicozzi showed maps of the taxable value per acre in places like Travis County, Texas, home to the city of Austin using Esri's ArcGIS 3D Analyst extension. The highest spike on the map was downtown Austin. Another map showed a high spike for alcohol sales in downtown versus the mall areas in the suburbs. He mapped other tax flow data for Travis County, including mixed beverage and food sales per acre. "You see downtown popping off the map," Minicozzi said. 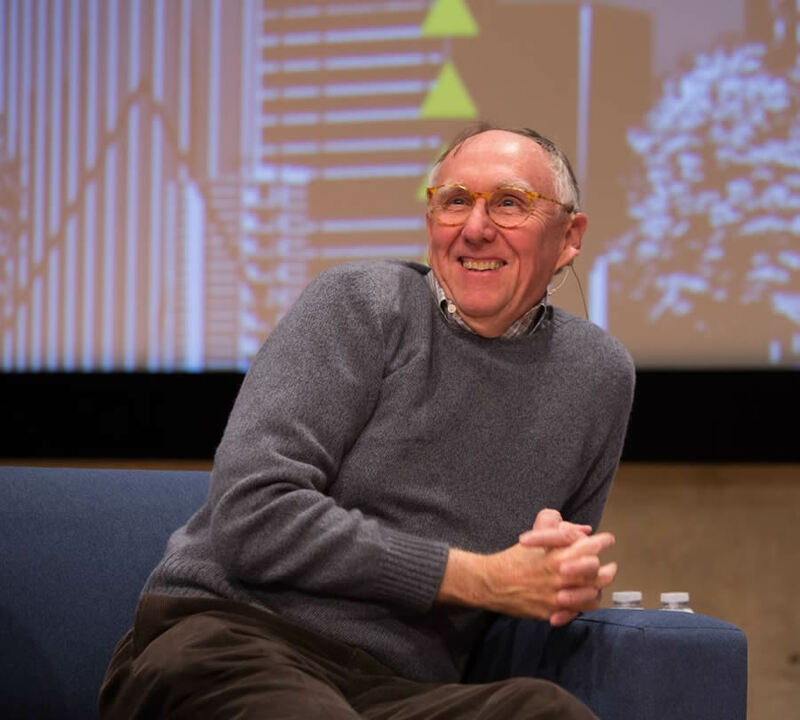 He recalled hearing Dangermond once say, "If you put it on a map, people get it quickly." That made an impression. "We've seen this time and time again, when we make these three-dimensional models of the taxes, people get it," said Minicozzi. He later handed out stickers to the audience with images of Count von Count from the children's television show Sesame Street that had the catchphrase "Do the Math" and of Dangermond with the saying "Do the Map." Cities today strive to be more walkable and bike friendly, said Brown, Citilabs' local government director. Studies show that people of all ages and income groups want to live in areas where they have easy access to jobs. They also prefer neighborhoods where they can do daily errands and participate in recreational activities without getting in a car, Brown said. All of these attractive qualities in a community represent different aspects of a characteristic that urban planners call "accessibility." Both governments and businesses need GIS technology to better understand how this dimension of transportation system performance affects their bottom line. Brown said Citilabs' Sugar Access solution for ArcGIS measures and maps accessibility by multiple modes of travel to points of interest such as restaurants, jobs, government and health services, and local businesses, while also bringing in demographic data about the residents including information about the labor force. 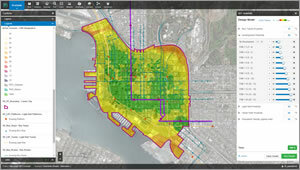 The software can help you test alternative scenarios, taking into consideration how new infrastructure or development projects might affect drive, walk, bicycle, or public transit times to various types of destinations. 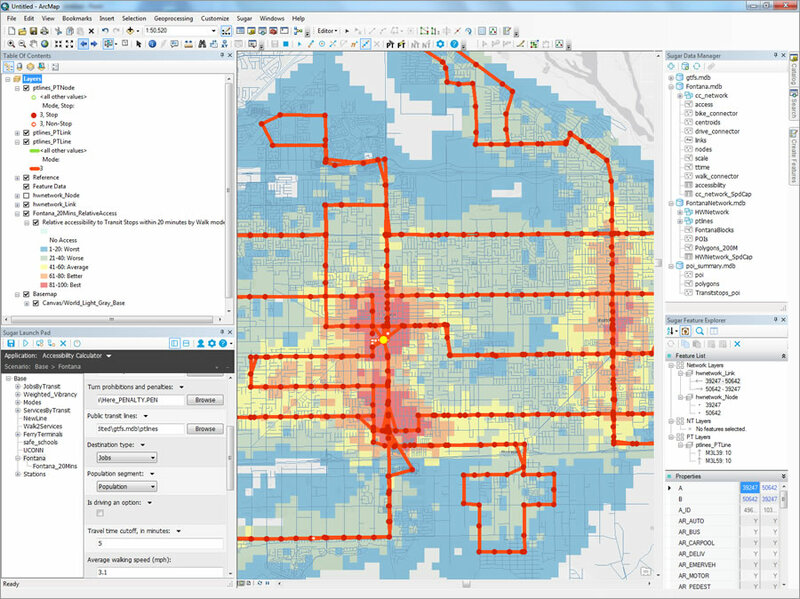 Sugar Access for ArcGIS also lets users import their own data, such as bike paths and, for 40 metro areas, incorporate Citilabs' own proprietary Streetlytics database of traffic volumes, speed, and congestion for all streets. To demonstrate what Sugar Access for ArcGIS can do, Brown showed a map created with the software's tools that displayed which areas within the city of Fontana, California, had the best, good, average, and worst bus service access within a 20-minute walk. This type of map better helps the city understand how its public transit system serves residents. "With Sugar Access and your local knowledge, you can plan and build a more livable city," he said. He said he and botanist Peter Raven joined Paul R. Ehrlich, author of The Population Bomb, at a gathering of the California Native Plants Society. "It was a thrilling conference with thousands of people who were biophiliacs interested in plants and living things," Dangermond said. Dangermond recalled that Ehrlich got up and told the audience that there was only about a 10 percent chance that in 100 years humanity would still go on. "This was very controversial to this audience," said Dangermond, adding that Raven disagreed with Ehrlich—claiming it would only be a 1 percent chance. This is where geodesign, supported by geographic science such as GIS, comes in to help decision makers create smarter communities and a more sustainable Earth. "We're here," said Dangermond, "to talk about how we create the future rather than be at the [mercy] of the future." 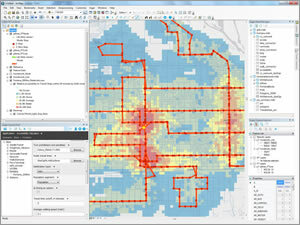 Esri's Rob Matthews demonstrated GeoPlanner for ArcGIS. He used the app's tools to create a hypothetical Bus Rapid Transit (BRT) route through downtown San Diego, California, leveraging a geodesign approach. Next, he used the tools in the app to study planning issues at multiple scales, from a citywide BRT routing to the fine-grained placement of stations and evaluation of landuse regulations to support Transit Oriented Development (TOD) at the site scale. He also demonstrated the app's capability to do live analysis in the cloud, such as walk times from proposed BRT stations, enriching design schemes with curated demographic data, and suitability for BRT station placement using a weighted raster overlay service. In his demo, Esri's Nathan Shephard used ArcGIS Pro to take this downtown San Diego design down to a larger scale. Existing 3D buildings (courtesy of Pictometry) provided context around potential building development sites, and a proposed building outline was digitized in 2D using precision-editing tools. A synchronized 3D view rendered the simple shape as a constructed 3D building—complete with realistic texturing—by leveraging a CityEngine authored procedural symbol. A simple spatial query identified which buildings would impact existing underground water mains, and the results of previously run solar and wind analysis were explored to see if the design would create areas that could cause heat islands. A few such areas, with high solar radiation and low wind speed, were identified. Rather than use ArcGIS Pro to interactively place individual trees into the design to reduce the heat, Shephard said the problem was better attacked parametrically, as part of the street design process. "This is made possible with the CityEngine procedural 3D modeling. If efficiency is important to your 3D pipeline, then you are really going to like this," Patrick said. Using data from Shephard's downtown San Diego demonstration, Patrick showed the audience Complete Streets, a "street rule" that incorporates knowledge and ideas from transportation planning guidelines and standards. 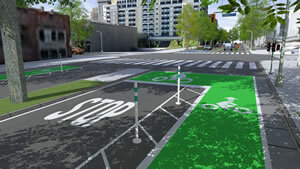 He used Complete Streets to generate a default street then added bike lanes with widths such as 2.5 meters; 1.2 meter buffers for each lane; and then planters, curbs, and trees. 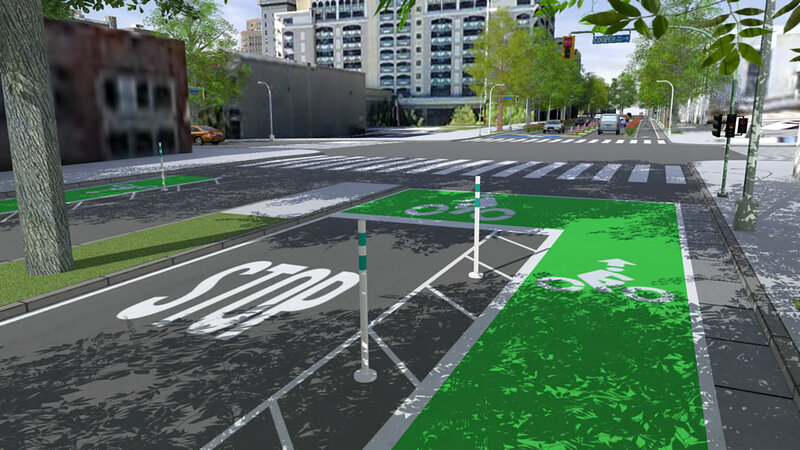 Not only can you visualize the bike lanes, curbs, and trees in 3D, you can also use Complete Streets to get analytical reports on various aspects of the street's geometry that will help you come up with rough cost estimates for construction work. "Planning our environment carefully—leveraging GIS, 3D, and the best possible design practices—will be critical for building a sustainable future," said Esri's Eric Wittner.